In this thread, you will see all my paintwork of Itasha Cars I have made in here. "Itasha" is a japanese term used to describe cars with painted decorations of characters from Anime, Manga or Video Games. These cars have been proven very popular in Japan including Conventions and the motorsport Industry. The templates I have used are from the game (Nascar Racing 2003) and the name of the template is Generation 6. All the artwork shown in this thread are not intended to be used or sold commercially so any depictions of Anime characters and/or other work that are not designed by me should be credited to their respective owners. I would not use these artworks for commercial purposes without permission and/or credit with the respective owners. Last edited by Gonzalez96; 03-18-2019 at 07:01 PM. Aww so sweet. If I saw those cars driving past me I think my heart would explode. How about a 'In Another World with my Smartphone' Nissan Skyline R34? hehehe. Awesome job though and great renders! As I am currently waiting for my mate to render the 2 cars for me, I have decided to give everyone here a sneak peek of the cars. Hopefully when my mate gets back to me with the pics, I'll post them on the list. @toshioa I will take your request and give it a try. At the moment I don't have a Nissan Skyline template as there are only 4 different templates in the mod i've using. It is however possible to make a Nissan Skyline template but I do have a Toyota Camry Template which you can see in the bottom second picture of the ones above. Last edited by Gonzalez96; 10-26-2017 at 10:20 PM. nice cars, is 26 a favorite for you? @Expendable Yes it is. I used to support a motorbike racer which uses the number 26. Last edited by Gonzalez96; 10-28-2017 at 11:44 PM. Do apologise if my process of rendering the cars was taking so long, as I'm not good at rendering them myself, I have to send some request to a few fellow mates of mine who are quite good with them. Very nice skin on the car, how do you create it? I took one of the PSD templates of the mod of a game (Nascar Racing 2003) and painted it using Photoshop CS2. Then I asked a mate of mine to render the 3d scene using a program called 3DS Max. Whilst I'm waiting for my mate to do the full rendering of the car, I am satisfied to reveal another car. It's TORADORA. The 3D Rendering for my Initial D paint scheme will be delayed, as the car is not properly finished and needs a few tweaks. In other words, another scheme has been made and has joined the family. Another scheme has also been made but will be rendered as soon as my renderer mate gets back to me. 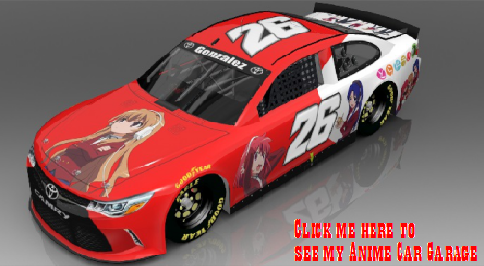 @toshioa I will start taking requests from anyone else willing to submit their animes to be made into a scheme by the time I reach around 10/13 cars. This is so that I can show myself how good I am with painting and have some experience into it. In the meantime, I will be holding your IAWWMS request until then. As for everyone, you are free to submit your requests now. In the past few days from this post, I have been painting more cars and so far I have made thirteen cars. Just in case if anyone dosen't know I have posted the pics of the renders at the top of the thread, hope you enjoy seeing the amount of work i've put up. I will now be taking requests from now on and with promise to @toshioa , his request will be done first. I do apologise if your request is taking so long, my recent college work and preparations for Christmas prevented me from doing it earlier. Last edited by Gonzalez96; 12-23-2017 at 01:34 AM.